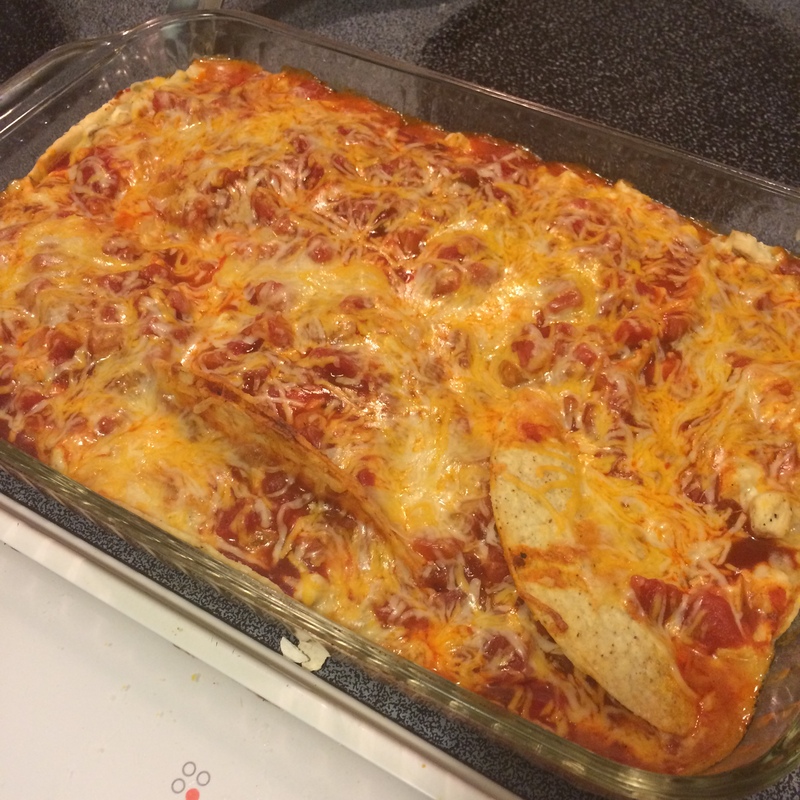 The problem: no one shopped for enchiladas this week. And with this, I made the requested chicken enchiladas! NOTE: while this particular collection of ingredients includes gluten and corn elements, it’s super easy to make this both corn and gluten free with homemade or Pacific stock and Harris Teeter Naturals refried beans or Natural Value organic refried beans. So far there are no flour tortillas that are both gluten free and corn free, and many contain soy. This is a great time to try your hand at making your own GF/CF flour tortillas with one of the many flour-based or cauliflower tortilla recipes available online; it’s a simple and quick process! 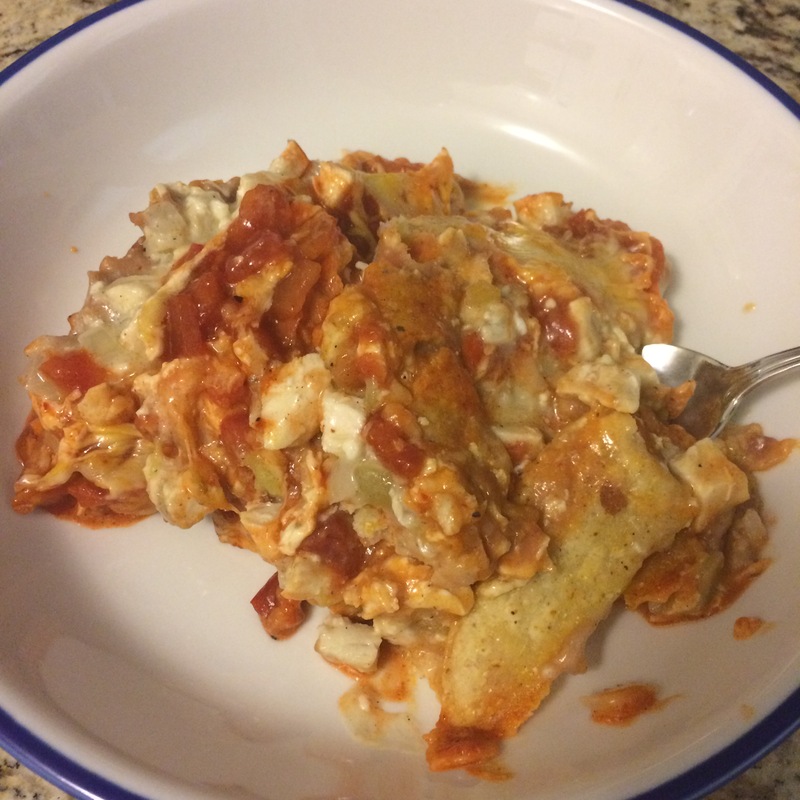 I get around the tortilla issue by baking a small dish of the filling and eating over rice; it’s a great way to use up leftover rice from a previous meal or even takeout. Boil the chicken for 15 minutes if boneless or a good 30 minutes if bone-in. While it’s boiling, get out a casserole baking dish and lay out the soft taco boats and the crunch taco shells so that you get the most in that you can. I was going for 8 taco boats and 6 taco shells. Since the chicken is still boiling, smear a spoonful or so of refried beans in the bottom of each boat and shell; add/repeat until you’ve used the whole can. Should be close to time to drain and cool and shred the chicken. Saute 1 chopped onion and 1-2 cans of green chopped chiles, no oil necessary. Yes, you can use fresh chiles, but this is about using what’s in the pantry and not having to go to the store to make dinner. Whisk 1/4 cup all purpose flour (gluten free all purpose flour works too) with 1/4 cup of your favorite cooking oil or melted butter in a bowl and add the blend to the sauce pan on top of the onions and chiles on medium until the mixture bubbles briskly. Add 1 cup turkey stock (or chicken or vegetable stock from a can or box) and 1/2 cup of milk (unsweetened, not vanilla almond milk or soy milk will work, but not rice milk). This will make a “white sauce” or loose turkey gravy. Add about a cup of cheese and stir until completely blended; I’m using the crumbly fresco cheese. Mix the shredded chicken into the pot. Spoon the mixture into each boat and shell until you’ve used it all. If you’ve got some leftover, pour it into a small baking dish to serve over rice or dip with chips. Top each boat with one or both of the enchilada sauces. I prefer the green, but we only had a small can of red enchilada sauce. Sprinkle up to 2 cups of shredded cheese on top. Bake at 350° for 15-20 minutes to get the enchilada filling good and bubbly and all of the cheese topping lovely and melty. Sometimes it really is that simple. Ugly, but incredibly yummy!